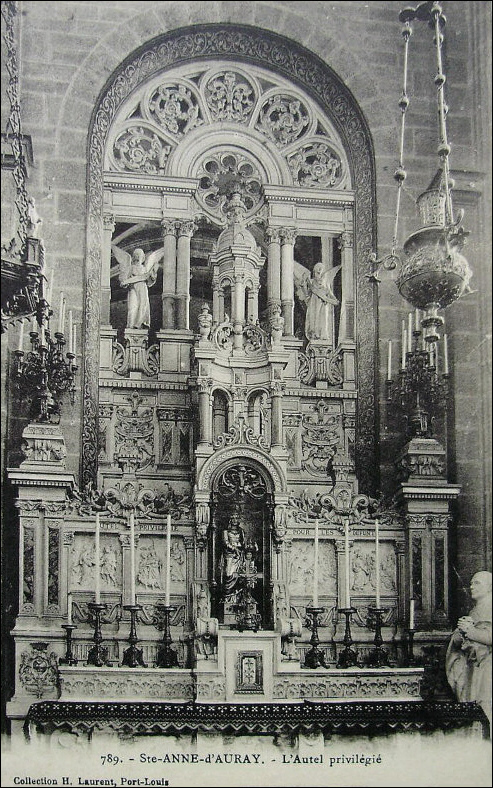 Priviliged Altar in the Basilica at Ste Anne d'Auray in Brittany, North West France, c. 1920 A.D. 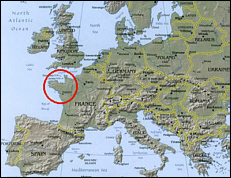 This map shows the part of France called Brittany (red circle). Although Brittany will experience the 3 Days of Darkness Chastisement - as the whole world will - multiple prophecies say Brittany will be the safest place on earth during and after it. It is also prophesied that a shrine will be erected there after "the 3 Days", where survivors (true Catholics) will flock. Not only had the Bretons been always remarkable for this strong attachment to the faith of their fathers, but nowhere had religion exercised a more salutary influence. The clergy were a zealous, unassuming, well-instructed body, entirely devoted to their round of sacred duties and possessing the respect and confidence of their flocks. Missions and retreats, in which all classes took part, were very frequent; Christian education flourished; crimes were rare, and the morals of the population remarkable for their purity. The geographical situation of this province isolated it in a certain degree from the rest of France, and its peculiar language added a further bar of separation. It was in consequence a region little known and seldom visited, and was thus preserved in a great measure from that influx of corruption so commonly introduced by strangers into countries which they habitually frequent."